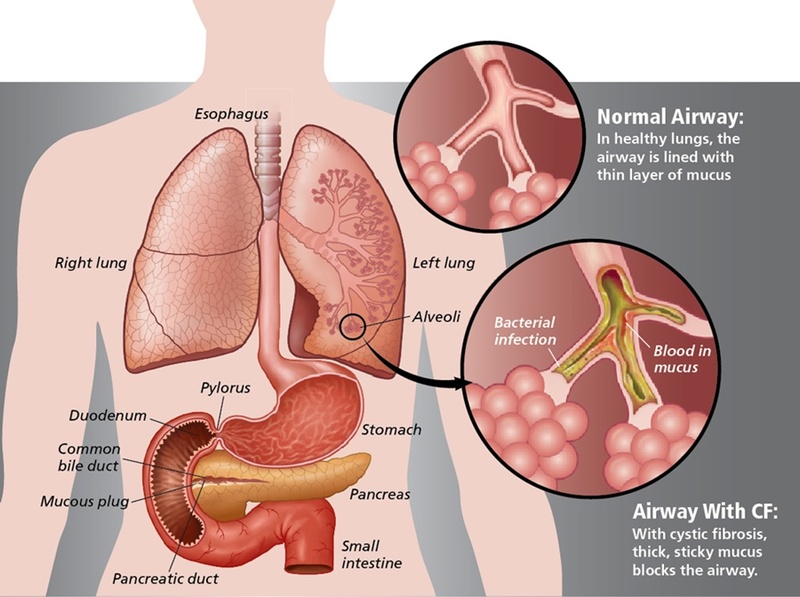 Cystic Fibrosis is a chronic disease that affects the lungs and digestive system of about 30,000 children and adults in the United State (70,000 worldwide). A defective gene and its protein product cause the body to produce unusually thick, sticky mucus that clogs the lungs and leads to life-threatening lung infections. The mucus also obstructs the pancreas and stops natural enzymes from helping the body break down and absorb food. How do people get CF? Cystic fibrosis is a genetic disease that occurs when a person inherits two copies of the defective CF gene – one copy from each parent. There is currently no cure for CF; however, specialized medical care, aggressive drug treatments and therapies, along with proper nutrition, can lengthen and improve the quality of life for those living with CF. What is the life expectancy for people who have CF? There is no way to accurately predict how long people with CF will live, as many different factors may affect each individual patient’s health. However, the predicted median age of survival at this time is 37 years old. The steady rise of the median predicted age of survival suggests how improvements in treatments are advancing the lives for those with CF. Today an increasing number of people with CF are living into adulthood and leading healthier lives that include careers, marriage, and families. What is a typical day for someone with CF? Take pancreatic enzyme supplement capsules with every meal and most snacks. Take aerosolized medicines – liquid medicines that are made into a mist or aerosol and then inhaled through a nebulizer. Because CF researchers are blazing new trails in drug development and gene therapy, experts have no way of saying for sure when a cure will be available. The ‘aging’ of the CF community is largely due to the increase of innovative new treatments and specialized medical care. But a better quality of life and partially increased lengths of life are simply not enough. That is why BEF supports the CF Foundation’s efforts to expand and strengthen the drug development pipeline of potentially life-saving new therapies while, at the same time, supporting a vital care center network.